One thing that often appeals to us collectors is a sense of order. There’s a strange sense of satisfaction to be gained from identifying something, learning its name, and placing it within a framework. Perhaps it’s a hangover from the Victorian era, which was arguably the great period of classification, or maybe it’s just human nature. Along with their immense visual charm and intricate printed detail, I guess this is one of the reasons why I find pot-lids so appealing. Pot-lids are one of the earliest forms of visual advertising, being first made in the 1830s and continuing until the 1910s. 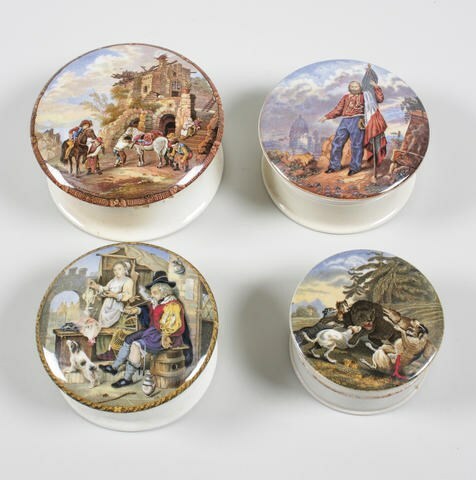 Makers of all manner of products, from toothpaste to meat paste and the now almost amusing sounding ‘bear’s grease’, (a healthy hair pomade, somewhat like hair gel), would package their wares in small ceramic pots with lids decorated with appealing images that, it was hoped, would help them sell more of their product. The same theory is still in action today, of course. Whilst the pot itself might show the name of the maker, or be otherwise decorated, the lid would bear an image that could often be totally unrelated to the contents. It’s here that we learn our first lesson. The interest and value is in the lid and the image on it! The rest of the pot doesn’t really matter too much. And, with around 360 known images, there is a veritable smorgasbord of different patterns to choose from. However, enthusiasts have classified them into different categories, and most choose to focus on one area. These include famous personalities, old English scenes, shells, bears, other animals, and the picturesque Pegwell Bay, near Ramsgate in Kent. Bear subjects and Pegwell Bay tend to be the most popular, fetching from under £100 to over £1,000 – a rare ‘Bear’s Grease Manufacturer’ lid with its somewhat gruesome image fetched around £3,000 in 2004. It’s also worth knowing that other subjects that cross collecting areas, such as military personalities, can be highly popular–they just attract different types of collector. The artistic side matters too. Over 120 of the varied designs produced were taken from watercolours by Jesse Austin, and these can have a strong following today. Perhaps unsurprisingly, the centre of production for pot-lids was in the ceramic heartland of ‘The Potteries’, in Staffordshire. A number of makers produced them, including F. & R. Pratt, T.J. Mayer, J.Ridgway and Brown-Westhead & Moore, with the former perhaps being the most prolific. Like the pot itself, the maker doesn’t make much difference to value or desirability, but it’s always nice to know, even though you’ll need a reference book to help out. Dating is a tricky subject, and it is near impossible to date a pot-lid precisely. Of course, if a lid commemorates a certain event, such as the Great Exhibition of 1851, one can say that it was produced around, but generally after, that year. Other pointers are based around shape and weight, but a number of other factors can apply. Colour came in during the early 1840s–beforehand most lids were monochrome. Earlier lids, from before 1860 tend to be flat (ter) and light in weight, being made from thinner pottery. Screw threads also generally indicate an early example. These also tend to have the best, and strongest, colouring and are often decorated with bear or Pegwell Bay subjects. Lids from the middle period of the 1860s to the mid 1870s tend to be more domed in profile and heavier in weight, whilst lids dating from after this tend to be yet heavier. The very latest lids, made from c1890 to the 1910s tend to be heavier still and are sometimes flat. The best advice here is to handle a few examples at a specialist dealer, auction house or, better, a club event where you’ll also be able to pick up all sorts of useful advice and tips. Now you know a little about the background, let’s get to the nitty gritty. We already know that the early period from the 1840s-1860s is the most desirable period, and we know that certain subjects are more valuable than others. Like so many collectables, there are a number of other general guidelines and, for the sake of the space, I’d like to limit these to four; colour, quality, variation, and condition. The colour and quality of the printed image is important. Look for strong, rich or bright colours that are clearly demarcated and well-printed. Just like collecting anything that is printed in colours, the more colours there are and the finer the level of detail is, the higher the quality and value is likely to be. ‘Registration’, where each colour of the design matches up with another is also important factor. Blurred images where one or more colour plate was printed slightly out of kilter from the rest is a bad sign. ‘Crazing’, or the fine network of lines that glaze takes on over time, can affect value, and crazing with large segments is often an indication of a later lid. Fakes are known. One good tip is that if you can feel the glaze over the glossy glaze, it’s a fake, as originals were printed under the glaze. Condition is, as ever, highly important, but perhaps in a more unusual way. Cracks and chips to the flange under the lid do not affect value considerably, mainly as they cannot be seen. However, if the damage affects the rim and image itself, this is serious and can reduce value by up to 70% or more. Restoration is the same, although collectors will often disregard this on an extremely rare lid. As I said above, it’s the image that collectors look for and if this is damaged, noses are turned up and shoulders shrugged. Many admirers and collectors will put circular wooden frames around lids, so that they can be displayed on a wall. If you see one of these at a fair, be a little suspicious. Yes, it might be old, but it may also be concealing damage. This isn’t a reason to tear the thing apart, so politely ask the vendor and I’m sure they’ll help. The same goes for very dirty lids, as the grime can often conceal a crime! However, the real money is reserved for variations– just like many Corgi or Dinky toys. These can manifest themselves in a number of ways, the most common being the border and wording. Fancy borders varying from ‘rope twist’ to a green ‘seaweed’ can add considerably to value. It’s the same for wording advertising the maker, contents or retailer. Also look for minor variations in the details of the image. Pratt’s ‘Lobster Sauce’ showing a startled cat, dead fish and inkwell on a desk usually fetches up to £50 when a window appears on the left of the image. Without the window but with a ‘fancy’ border and wording, the value can leap to around £200! As there are so many variations, and not all lids are found with the same types of variation, I really advise you to invest in a copy of the book listed below, which lists all pot-lids with their own reference numbers. No, I’m not on commission, but I was once told by an eminent dealer that the expense of buying a good reference book is usually paid back in a few (then more educated) purchases – believe me when I say that I have found this to be 110% true! Most pot-lids can be found for under £100, quite often under £30-50, making them an affordable area to collect, as well as a highly varied one. But if you know what you’re looking for, you can really cash in. With the general trend in our world moving from the ‘antique’ to the ‘modern’, now is the time to check out those recently forgotten ‘antique’ collectables. Pot-lids still attract a strong number of dedicated collectors, particularly in the US, and the market shows no signs of dying out. Recently, my colleague Andrew Hilton of Special Auction Services in Berkshire sold the Leslie Crowther collection of pot-lids. Ring any bells? Thought it might. Well, it’s true to say that if the ‘price is right’ and you know what you’re doing – you can really go potty over pot-lids!